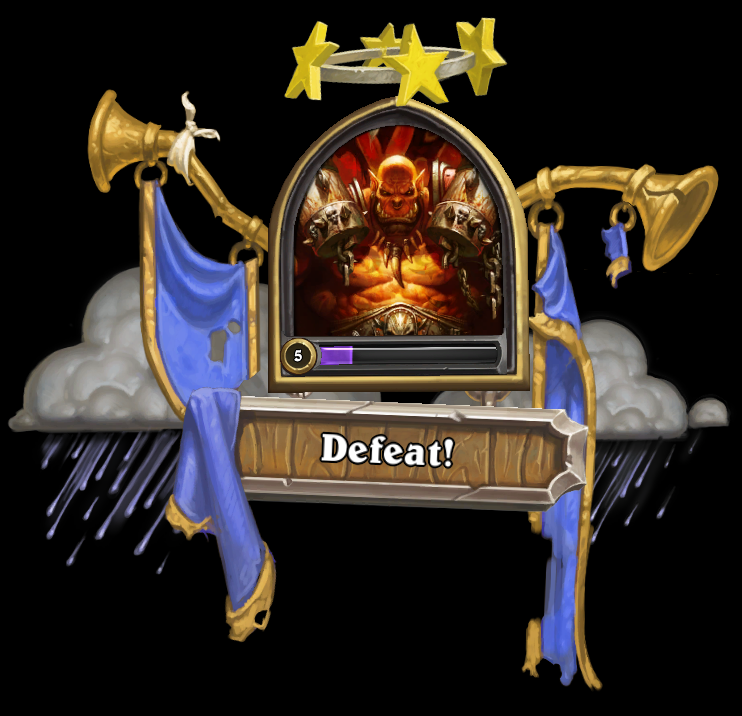 Hearthstone : Heroes of Warcraft is a card game where you need to lower the opponent's life to 0. To do so, you have a deck of cards (split between class cards from one of the nine World of Warcraft classes (wait, nine?) and creature cards) and a special hero power unique to each class. The game will be free to play and is currently in beta, but as the core mechanics probably won't change, I feel like it's fair to give it a look right now. After a tutorial where you fight iconic World of Warcraft characters such as Leeroy Jenkins and Some Other Guy and learn the basics of the game, you're dumped with the task to defeat each other class once to unlock them. These fights are pretty easy and I didn't have any trouble getting everything unlocked, that being said, starting with the mage isn't that interesting, why not give a choice? By the time I had every class unlocked, I was level 8 or 9 with my mage, so I just kept playing with it, not wanting to restart level 1 with another. That being said, what you get with your class is basically one hero power and some unique cards that only this class can own. The hero powers can make a big difference and they are quite different by themselves, the mage can deal 1 damage to anything, the warrior adds 2 armor, the priest heals, the paladin can summon 1/1 troops, the shaman can summon random totems... And the cards themselves play into the archetype that the class represents. As you level up, you get more cards that fit into the character's theme, they won't always fit with your playstyle, but they somehow all fit together. 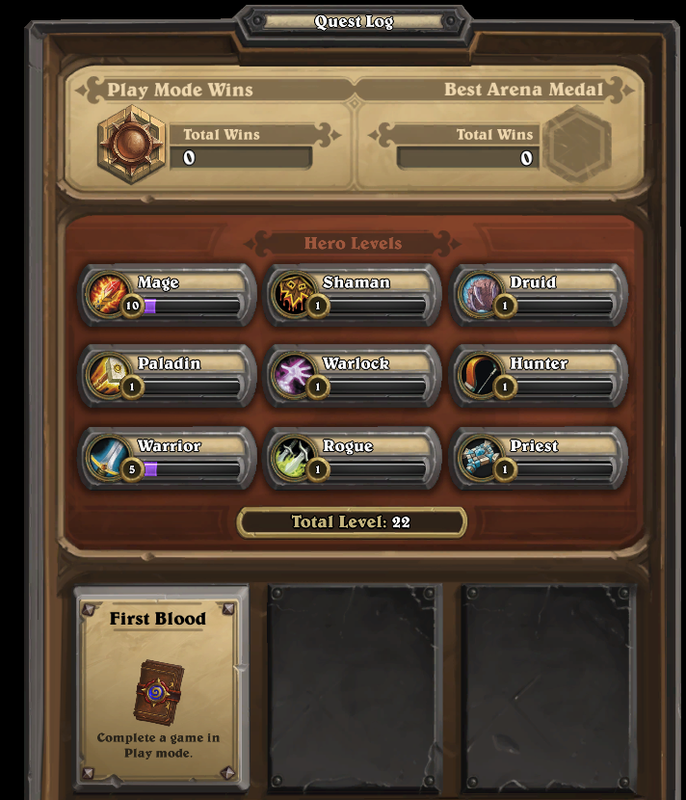 The quest system is interesting and always having new daily quests can keep the player interested, there's not that many different things you can do in a card game, but the fact that you have goals to get more gold is quite useful. Of course, the problem with quests in competitive games - I'd compare that to complex achievements in LOMAs - is that you're going to play differently just to get the quests done, and that sometimes can be detrimental to the overall 'winning' strategy. Getting a quest to play 20 minions that cost 5 or more might make you play a bunch of costly minions even though you're losing - it's no big deal since you're completing quests, right? The way a match works is as follows; There's a coin flip, then either you start or you get one more card and one more mana crystal. Each turn, your mana crystal capacity increases by 1 (up to 10) so as the game goes on, you naturally can cast more expensive spells. Some abilities also might give you mana. Except if you have a very costly starting hand (and you can trade cards) you should never be lack mana since it grows automatically - unlike Magic The Gathering. Cards have many effects, from making you draw cards to dealing damage to summoning other creatures when they are played. Creatures come in play unable to attack - except if they have hast- I mean charge and they keep their health between turn - something that'd be annoying to keep track of in a real card game. And the problem with me and this game is in one of the core battle mechanics. I don't like card games where the attacker chooses where the damage goes. In Magic, for instance, the attacker chooses what he attacks with and the defender decides if he's willing to lose creatures or lose hit points directly, in Hearthstone, the attacker can target directly the other player - except if the defender has creatures with the Taunt ability. For some people this might not be an issue, but I think this removes a layer of strategy since you can't choose how to defend yourself, only how to attack, and it messes the way I think about 'trading' creatures. Also there are no 'interrupts', no destroying an enemy creature before it attacks or anything like that. This game is well done and the free to play elements seem like they could be kept in check, but I just lost too much even by trying different strategies and decks - the only one that went fairly well is a taunt-heavy, summon-heavy mage deck, but I found it boring to play - but then again, my issues with the combat system aren't deal breakers for everyone, they just are that for me.